The Sisters of St Clare formerly of High Street, Newry trace their roots directly to St Clare of Assisi in the 13th Century. In Ireland from 1629 the Poor Clares suffered years of persecution, exile and dislocation. In 1712 Dr Edmund Byrne invited the Galway Community to make a foundation in Channel Row, Dublin. From 1715-1750 they resided in Dorset St. During the Penal Times life for religious sisters was difficult. They remained faithful to their Religious Profession, but religious habit and emblems were abandoned. The 19th C brought poverty, unemployment and children were orphaned. In 1803 Marie O’Brien was the principal benefactor of an orphanage in Harold’s Cross and she needed a religious order to run it… The Archbishop John Thomas Troy and Fr Michael Kinsella OFM Cap approached the nuns in Dorset St and proposed the running of the orphanage to them. They accepted and the Sisters moved to Harold’s Cross in 1804. This step marks an important point in the history of the Order, with the Sisters taking on an active apostolate- at this moment the care of orphans. 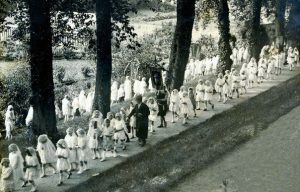 Later when the Irish Sisters of Charity vacated an orphanage in North William’s St a few sisters from Harold’s Cross under the leadership of Mother Michael Tracy took over the running of the establishment. 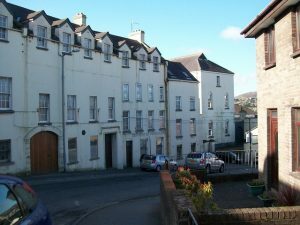 In 1829 this community was invited by Dr Thomas Kelly, Bishop of Dromore, to make a foundation in Newry to educate girls, again a modification in the lives of the Sisters, now not restricted to the care of orphans, but making themselves available for the education of girls. 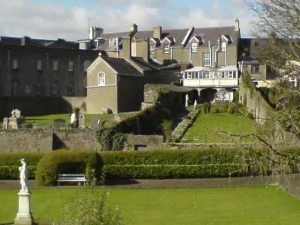 The history of the Poor Clares in Newry is one that placed a strong focus on the education of women, enabling them to take their role with confidence in society and the Church. Lace Making and Knitting Industry- this was set up to create jobs for women. Sodalities such as- Children of Mary, Our Lady of Perpetual Help/Lamp were established. 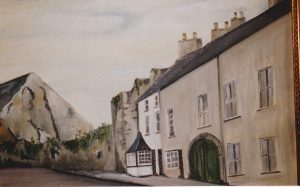 The first crib in Newry was displayed in the Convent in High St.
From Newry other foundations were established in Ireland, England, Scotland, Wales, North and Central America. Prayer and Contemplation remain the basic reason for our existence but the sisters are involved in many other ministries. Parish Ministries, Counselling, Education in Primary and Grammar Schools, Adult Education in the U3A, Aromatherapy, Psychotherapy, Pastoral Care of Sick Sisters, SVDP, Cathedral Choir, Catechism of Indian Community, Spiritual Direction, Retreat Work. Intercessory Prayer for The Year of Consecrated Life, Directed Prayer Week, Prayer Around the Cross on Fridays of Lent, Lectio Divina Group. Contact main reception: 028 30 252179 to be directed to a particular Sister or to leave your prayer intention.